Get the most out of the Plazes location based service. Is there a better alternative to Plazer? Is Plazer really the best app in Applications category? Will Plazer work good on macOS 10.13.4? Plazer lets you get the most out of Plazes, a location based service which is still in beta. 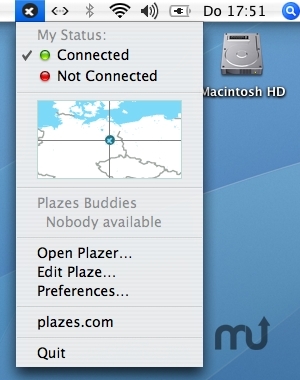 The Plazer looks for the hardware ID of your local network (MAC ID) and checks whether it is already in the database with an address, so we can plaze you at that location. That is all it does. The Plazer is NOT Spyware or Malware. Sending your router's MAC ID to Plazes does not make your network or your Mac vulnerable to any attacks. Still your MAC ID is not accessable to anyone and is only used for identifying your network. Version 3.0.9.5: Release notes were unavailable when this listing was updated. Plazer needs a review. Be the first to review this app and get the discussion started! Plazer needs a rating. Be the first to rate this app and get the discussion started! Plazes lets you discover nearby locations or people based on where you are and recommends things you should check out or people you should meet based on your past whereabouts.